Disc Golf, aka Frisby Golf, is a brand new addition to our range and is suitable for use either outdoors or inside sports halls. The game can be played in the wet or dry so the weather needn't stop the fun! Its an ideal game for use by schools, youth groups, at corporate fun days and team building events. Disc Golf is suitable for most ages and fitness isn't really a requirement, as long as you can throw a frisbee you can play disc golf! 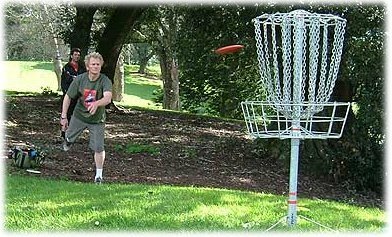 Disc Golf started in the 1960's in the USA but has become increasingly popular here since featured in video console games such as Wii Beach Sports. Disc Golf follows the same idea as traditional golf only the aim is to take a series of throws to hit an aerial target basket with your disc or frisbee rather than putt your ball into a hole. The person using the least number of shots wins. In traditional golf you have different clubs for different shots and in Disc Golf you have different discs for different shots and distance requirements - a Driver Disc, Mid-Range Disc, and Putter Disc. Disc Golf can be played anywhere there is space to throw the disc so it can be used in sports halls as well as outdoors. When space is limited you can have the Disc Golf equilivant of a putting green where a single disc is used to cover a short distance to the target basket. Outdoors you can have longer holes and incorporate features of the surrounding area such as trees and streams to make for some longer and more interesting holes that can cover upto 200 yards. If you have any queries, questions, or would like to book our Disc Golf for your event please call us on the number below or click to enquire and we will do all we can to help. If you're holding a Beach Party themed event then our Disc Golf makes for a great game as does our Inflatable Beach Volleyball Court or Surfboard Simulator Ride that may also be great additions to your event.